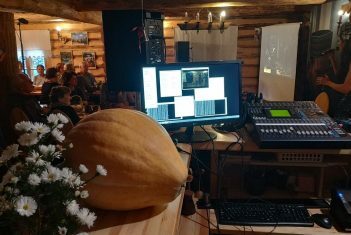 On 1st of October 2018 took place the first ever 5G concert, that was organized with the help of 5G network and LoLa streaming technology simultaneously in two locations: at the Estonian Academy of Music and Theatre in Tallinn and at Seto Culture Museum in Setomaa (with the distance of 300 km). The concert was held as part of the International Music Day programme. The concert was organized in collaboration with the telecommunication company Elisa. Due to the 5G network of Elisa and the Academies Low Latency Audio Visual Streaming System LoLa, it was possible to arrange the concert simultaneously in two locations in Estonia. The concert on 1st of October was also a demonstration of the 5G network of Elisa. In 2017, the Head of IT at the Estonian Academy of Music and Theatre, Innar Järva achieved the first prize at the 5G ideas competition, that was held by Elisa, business ideas competition Ajujaht and technology news portal Geenius. Due to the competition, the Academy became the first university in Estonia, which hosts its own 5G-support station of Elisa on its premises. The station was also used for organizing the collaborative concert on 1st of October. LoLa technology enables musicians, who are located up to 5000 km apart from each other, to play together in real time. The collaboration of LoLa technology and 5G network creates the first mobile solution, that has fast enough speed and minimal latency to enable playing music in real time via audio visual streaming without the need for broadband connection. The performers of the concert on 1st of October in Tallinn were pianist Mihkel Poll, guitarist Jaak Sooäär and percussionist Tanel Ruben, who played together with musicians, who were located 300km away in Setomaa: cellist Henry-David Varema and singer Laura Põldvere. LoLa technology is the project of Giuseppe Tartini Conservatory in Italy and the Italian Consortium of the Science and Education Network GARR. The Estonian Academy of Music and Theatre received the LoLa hardware with the support of the Estonian Education and Research Network of Information Technology Foundation for Education from the European Union projectGÉANT-EaPConnect.